Nearly a year after the party lost the 2017 election, the weekend’s National Party conference felt like one of those Sunday nights on RNZ, when everyone can forget about all the modern stuff and tune back into the way we were. Somehow, someone thought the best way of conveying the conference theme of ‘new leader, new team, New Zealand’…would be to have a prehistoric Australian politician (John Howard!) as the inspirational guest speaker. Howard reckoned MMP had been a bad idea. The new team (Judith Collins! Paula Bennett!) was also present, functioning mainly as mementos of better, happier days. As for the new leader… as many have noted, Simon Bridges’s promise to reduce class sizes – sometime in the unspecified future by some unspecified degree at some unspecified cost – couldn’t help but stir a few unhappy memories. Remember how new broom Hekia Parata launched her ministerial career in 2012 by promising to increase class sizes? Just as unfortunately, David Cunliffe also went into his one and only election campaign as Labour leader promising to cut class sizes. Yet at least Cunliffe stated the specific ratio and timeframe he had in mind (1.26 by 2016, reducing to 1.23 by 2018) and specified the source of funding to make it happen. On the weekend, Bridges fudged all of those difficult, messy details. Clearly, his main job was to feed comfort food to the recently dispossessed. Back in the real world of course, more teachers are not something you can deliver, simply by turning on a tap. You have to attract people into the profession, by improving teacher pay and work conditions, and you have to ensure that teaching is a rewarding job, so that teachers feel motivated to keep doing it. Yet while National was in power, its dated emphasis on National Standards and related mania for continuous testing did a great job of driving people out of teaching. In 2009, 1,200 trainees completed an initial teaching qualification for secondary school teaching : in the wake of steady annual declines, this had fallen to 775 by 2015. See table three at p.10 table of this link. The same document also tracks the annual declines in those specialist subjects under pressure (eg natural and physical sciences, maths, information technology, computer science, chemical sciences etc) and the figures there are even more alarming. In the specialist areas, New Zealand was training 1,135 teachers in 2009, but only 760 in 2015. The age profile of teacher trainees is just as disturbing, with a 27% decline evident among the under 25 age group since 2009, and declines of 29% and 56% among the 25-34 and 35-49 age groups respectively, over the same period. All up, this is a profile of a profession in serious trouble – and arguably, it is also a reflection on the past nine years of absentee government. 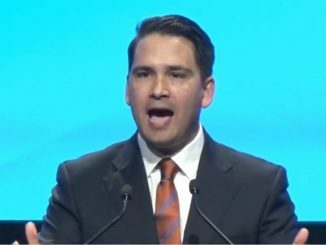 In his conference speech, Simon Bridges did not address how the policies of those nine years of National government may have contributed to the crisis now facing public education. Instead, Bridges promised to further undermine state education, by pouring money into creating 30 new charter schools. In similar vein, National will no doubt sit on the sidelines later this year, and voice its outrage at how the teacher unions will be going about trying to improve the incentives (a) for people to enter the profession, and (b) to remain as teachers once they’ve been trained. Already, one can hear Bridges telling us not play the’ blame game” by referring to the education crisis that the coalition government has inherited. Yet in line with the old timey nature of the National Party conference the public would be well advised to recall the old cliché…. about those who cannot remember the past, risk being condemned to repeat it. If the weekend’s conference told us anything, it is that this country can’t afford to put this lot back behind the wheel. Famously under MMP coalition government, the junior parties provide stability and serve as a restraint on the major parties. Yet in doing so, they also put their core support in jeopardy. If you’re a populist party like New Zealand First you can’t credibly rail against a political establishment that you, in a very real sense, created. If you’re the Greens, it gets even harder. Political expedience always looks bad. It looks particularly bad for a party like the Greens that has always claimed that being true to its core values is what has sets it apart from its political rivals. Moreover, the Greens had long preached the necessity of being in government, so that they could make a difference. Of late, they’ve looked more like captives. Their victories are being eclipsed by their concessions, and if anything, this pressure to keep on taking bullets for the team is only likely to increase. As a competing junior player in the coalition arrangement, New Zealand First also needs to chalk up policy victories. Right now though, NZF is winning considerably more in the way of recognisable gains on defence spending, on the waka jumping legislation, on the ongoing largesse from the Regional Development Fund etc. By contrast, any Greens gains on say, the administration of our climate change response have had virtually no publicity cut through, or – as with the gains on paid leave for victims of domestic violence – are seen however unfairly, as adjuncts to Labour’s initiatives on paid parental leave. Before 2020, the Greens will need major gains that set them apart from Labour. Especially on the social justice front, where it risks looking entirely redundant. Really? That’s arguable. The Greens did not have to sign up last year to the Budget Responsibility Rules that continue to restrict the government’s ability to meet social needs. They chose to do so back then, and they’re choosing right now not to revisit that decision. Sage has been here before, too. In June, in her role as Lands Minister, she claimed that the Overseas Investment Act prevented her from refusing consent to a land purchase by a large Chinese company that would enable it to expand its water bottling operations. Reportedly, the Greens’ rank and file were outraged by Sage’s decision. Understandably so. At last year’s election, the Greens had targeted water bottling consents, proposed a tax on water exports, and promised greater respect for Treaty rights around water. It is very hard to argue that a shift of this magnitude is actually a sign of political maturity, and not a sellout. Ultimately, a game of chicken is involved as to who is prepared to walk away from the coalition, over these kind of policy divergences. That time may come for the Greens, closer to the 2020 election. Yet right now New Zealand First is winning hands down the conflicts over policy differences. Significantly, Shane Jones doesn’t even need to be nasty to the Greens these days, such is their apparent readiness to fold their hand. Over the sugar tax impasse, on the NZF hostility to tobacco taxes, their criticisms have been muted. At some point, the Greens are going to need to display a backbone. If it is to survive, the self-declared party of principles will have to demonstrate a greater willingness to fight for them.